No one could stay down and out if you offered them this bouquet. 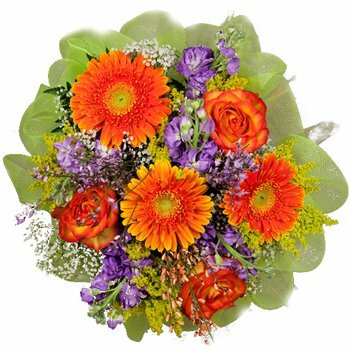 Perky Gerbera daisies in brilliant orange and lovely roses in shades of sunset explode from a background of vivacious purple wildflowers and a puff of pale green ribbon. Sure to make an impression the Lifting Spirits Bouquet is perfect for Housewarmings, to say Get Well Soon, or as a centerpiece for a family gathering. We provide flower delivery services to the following locations in Thailand: Chiang Mai, Chiang Rai, Hat Yai, Khon Kaen, Lampang, Nakhon Pathom, Nakhon Ratchasima, Nakhon Sawan, Nakhon Si Thammarat, Nonthaburi, Pak Kret, Phitsanulok, Phra Nakhon Si Ayutthaya, Phuket, Rayong, Samut Prakan, Samut Sakhon, Songkhla, Surat Thani, Trang, Ubon Ratchathani, Udon Thani, Yala, and other towns in Thailand.